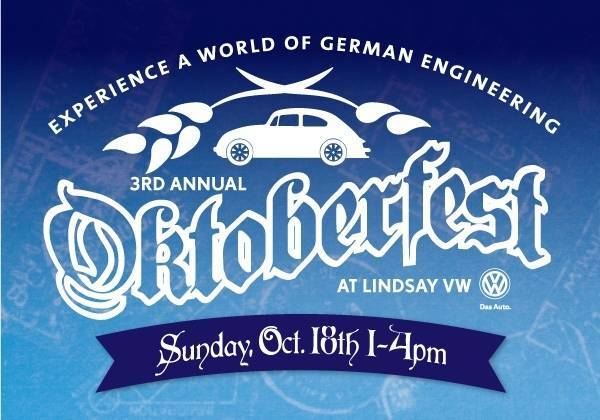 We are pleased to announce the 3rd Annual Lindsay VW Oktoberfest, on Sunday, October 18th from 1-4:00 pm, celebrating all things Volkswagen and showcasing the German engineering behind Das Auto. The main focus of this year’s event will be a Car Show in which our attendees are the judges and will have the opportunity to win, alongside the contestants, just by casting your vote for your favorite Volkswagen! In addition to the Car Show, there will be plenty of Oktoberfest themed festivities and goodies including: food trucks, a local brewery, DJ, cupcakes, corn hole, and so much more! We’ll also have our Lindsay VW team on site performing test drives and providing information for those interested in the latest of what Volkswagen has to offer. There will be a raffle throughout the day, for which each attendee will automatically receive one free chance to win from a selection of amazing prizes donated by Lindsay VW, local vendors, and even a few of your favorite local sports teams! There will be plenty of ways for you to increase your chances of winning as well. For example, receive additional tickets by making a donation to Autism Speaks, or by engaging with us on social media. You don’t want to miss out on these awesome prizes! Whether you’re a seasoned VW enthusiast, or new to the brand, we hope you will join us for a fun-filled Oktoberfest event celebrating all things Volkswagen! There is no fee to attend.